The Tuscan Racer sports car. From the early days, TVR had been closely involved in motor racing, and enjoyed the glamour associated with such participation. In 1986, the works team centred on the TVR 420SEAC sports car, which gained a dominant position in national race meetings. However, things came to a head when it was banned from racing by the authorities for reasons of homologation. This meant that they refused the car certification to race, since they questioned the number of units built. In 1988, Peter Wheeler, the owner of TVR at that time, decided to get round this ruling by creating his own race series, and building a new race car specifically for this purpose. He named the Series the Tuscan Challenge. It was, in fact, a one make series based on the new car, which was called the TVR Tuscan Racer sports car. Based on the successful TVR S-Series of sports car, the prototype racer was powered by a 3.8 litre, Buick V6 engine, and was premiered at the 1988 British Motor Show at the NEC in Birmingham, together with plans for a road going version. In order to cope with the huge increase in power, the development of the chassis ended up with a completely new structure incorporating a wider track, longer wheelbase, and additional strengthening. The Buick engine was now replaced with a tuned 4.4 litre, dry sump Rover V8 engine, fitted with four Webber twin choke carburettors, which developed 348 bhp, and 279 ft/lbs of torque, and used a Borg Warner T5 five speed gearbox. By the early 1990's, the Rover V8 engine had reached the limits of its development, and so TVR turned to its own in-house AJP8, V8 engine, which developed more power than the Rover unit. This was, in fact, a 4.5 litre, TVR Speed Eight engine, which developed 450 bhp, and 380 ft/lbs of torque, and produced a top speed of 190 mph, with a 0-60 mph time of 3.9 secs, and a 0-100 mph time of 6.9 secs. The Tuscan Challenge Championship was introduced in 1989, and became the most important single make race event in the UK. At its peak, the race featured close racing involving over thirty cars, and received extensive TV coverage. Over the years, a number of the drivers who took part in the event moved on into other championship events. From the onset, in 1989, in order to attract the largest field possible, TVR offered the first batch of Tuscan Racers at half the selling price of £32,000 on the proviso that the entrants would agree to compete in at least six of the twelve races comprising the championship. Should they compete in less than six events, they would be required to pay the full selling price by the end of the season. As it turned out, the Tuscan Challenge was an immediate success in its first year, so much so that TVR decided to shelve plans for the introduction of a road going version. A total of 41 units of the Tuscan Racer were built. Peter Wheeler encouraged all the TVR dealers to enter, or at least sponsor, one of the Tuscan Racers in order that there was a good line-up of cars on the grid, so ensuring an exciting race meet. He and other TVR management also competed in the events. By 2005, when the new owner of TVR severed links with the championship, the company had sold off all of its Racers, and so the event was scaled back in order that a wider range of TVR models could now be enetered, so ensuring its continued success. 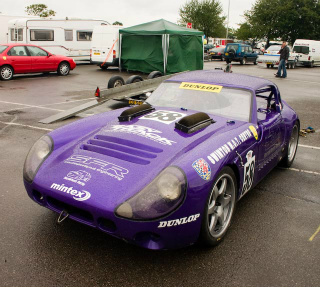 A 1989 TVR Tuscan Racer in very good condition would command in the region of £25,000/$40,000.